An American in Ireland: North Wicklow's own Hotel California? Now that the days of squeezing pennies out of the peasants has passed the descendants of the local landed gentry have to find new ways to pay for the upkeep on their large homes and estates. Killruddery House in North Wicklow is no exception. There are concerts there during the summer, movie and television programs are filmed there (Angela's Ashes, The Tudors, Camelot are three you might know) and there is a regular stream of events for which the general public can pay into the estate. All very praise-worthy, much better than their plan to sell off more of the land for housing development. All of which brings me to their new sign. 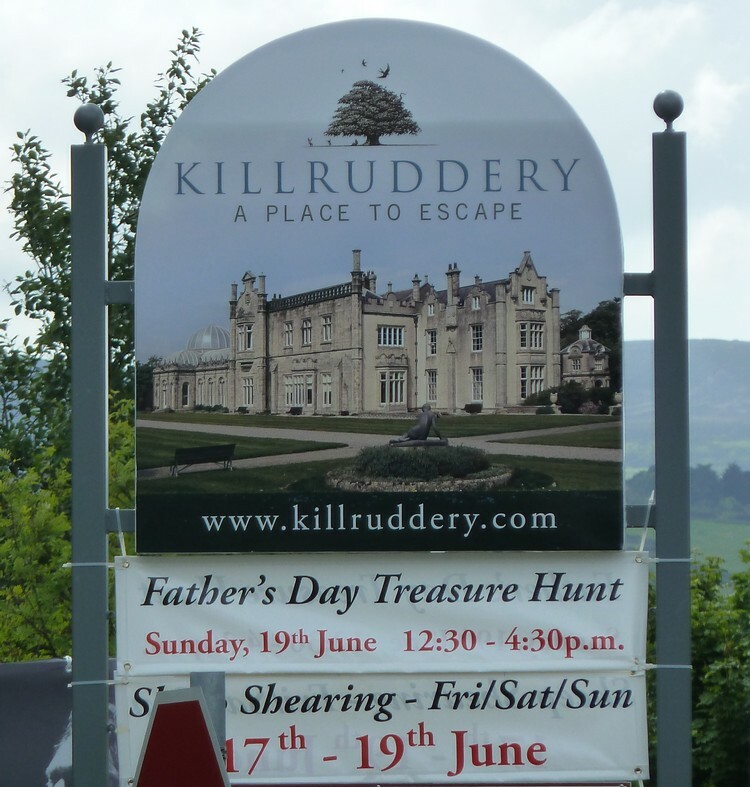 The other day after my trip away I was driving by Killruddery when I saw that they had a new sign outside the main gate. The sign is an attractive invitation to the passing public to drop in. You can (pay to) visit the house, (pay to) visit the beautiful gardens, (pay to) walk the hills that make up much of the estate or (pay to) enjoy one of their many special events. The sign is a lure. Nice sign, I thought, but then I saw what was written on it. Immediately I said to myself, "Sometimes phrasing and grammar matter." Right there on their nice new sign beneath the name Killruddery was their new slogan: "A Place To Escape." Uggh. Of course I knew what they meant, but my reaction was to laugh at them. "Sounds like Colditz or Alcatraz or, better yet, Hotel California." I'm know that's NOT the image Killruddery's owners have in mind. In fact, I'd be surprised if they weren't happy at the end of each day when the last of the riffraff leaves their grounds. That's not what their sign says, however. According to the sign getting away from the place is the real joy. Time for Killruddery sign 2.0.